Jack Widdicombe, 97, Lancaster pilot, with an Avro Anson Mark 5 like one he used to fly on “staff jobs.” The plane is part of the collection at the British Commonwealth Air Training Plan Museum in Brandon. Lancaster pilot Jack Widdicombe was a wide-eyed Prairie farm boy about to be thrust into the inferno of Second World War Europe when he boarded a double-decker bus and toured London shortly after arriving in England. The 21-year-old native of Foxwarren, Man., and a pal set out to see the sights and instead encountered block after block of rubble. Twenty-three bombing missions over Nazi territory and 1,200 hours of combat and other wartime flying lay ahead of him. “We drove for an hour and it was total destruction,” Widdicombe recalled in a recent interview at the British Commonwealth Air Training Plan Museum in Brandon. “I said ‘how in the world can people do that to one another? Why don’t people refuse to do it?’ Then a year later, I was doing it. 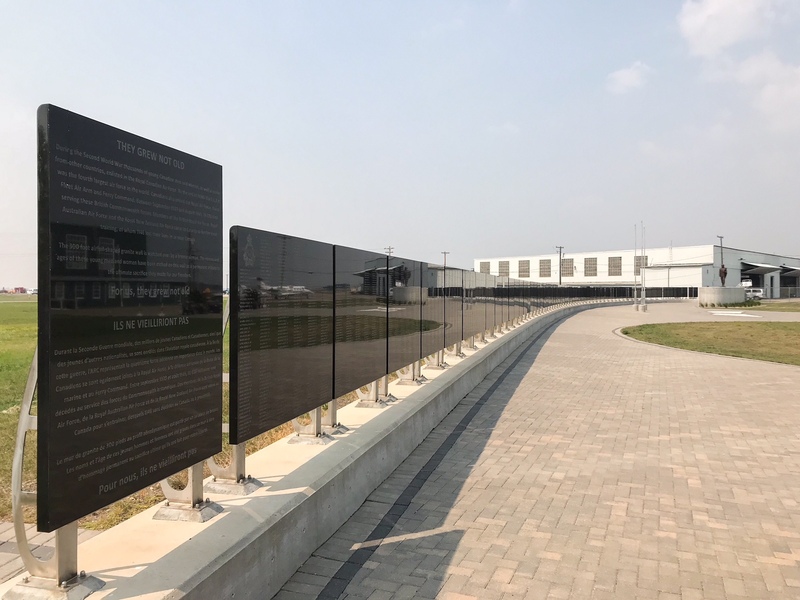 (Click-to-Enlarge) Memorial wall at the British Commonwealth Air Training Plan Museum in Brandon. It lists all 18,039 aircrew killed while serving in the forces of Canada, Britain, Australia and New Zealand during the Second World War. Some 131,553 aircrew, including pilots, wireless operators, air gunners and navigators from all four countries were trained at 151 schools across Canada between 1940 and 1945. Now 97, the lifelong farmer remains sharp as a tack and has no regrets. 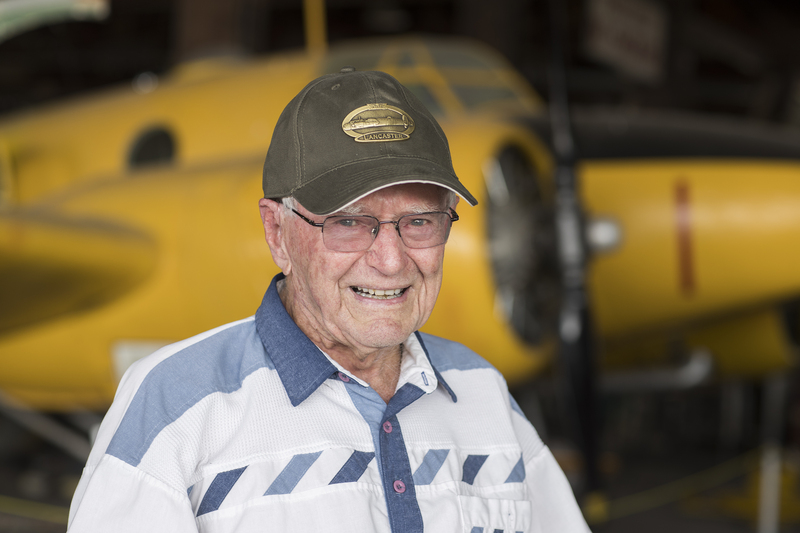 He hitched a ride to the museum from his longtime home in Russell aboard a small four-seat plane, bent on watching an airshow by vintage training aircraft while his wife of 71 years, Florence, 95, was off indulging in her passion, singing. Widdicombe talked of flak-filled skies, attacks by Luftwaffe night fighters, and pressing home a bombing run on three engines. He recalled with affection the tight bonds and lifelong friendships he shared with his six-man crew, and reflected on the fact he is the last of them alive. Flight Lieutenant Jack Widdicombe was among 131,553 aircrew—pilots, wireless operators, air gunners and navigators—from Great Britain, Australia, New Zealand and Canada to train at 151 schools across the country between 1940 and 1945. Lancaster crew of VR.N KB857 No. 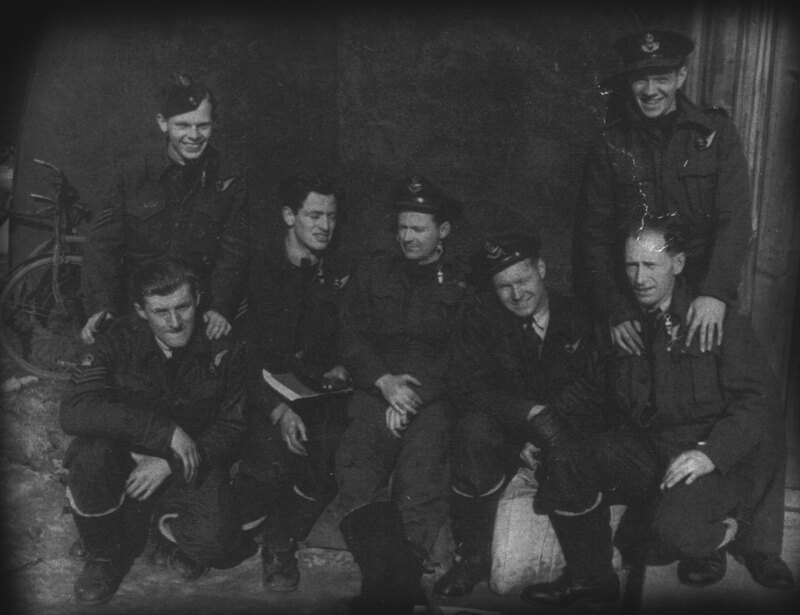 419 Moose Squadron, the black and white picture clockwise from top right: rear gunner Gord Cotter, bomb aimer Lew Andrews, navigator Hugh Church, pilot Jack Widdicombe, wireless operator Fred Trigg, mid gunner Steve Kranyak, engineer Cliff Moore. He earned his wings in Prince Albert and Saskatoon, starting out in a Tiger Moth biplane and graduating in a twin-engine Cessna Crane. He spent another year training on Wellington and Halifax bombers in Britain before his first Lancaster mission with 419 Squadron, Royal Canadian Air Force. His voice trails off, then rises again as he announces that his tail-gunner, Gordon Cotter from Oshawa, Ont., shot down a Me-210 fighter that night. Both Cotter and mid-upper gunner Steve Kranyak from Hamilton were “firing like crazy” as the Luftwaffe twin-engine aircraft attacked from behind. Staging out of a chain of bases in northern England, 419 Squadron flew 4,325 wartime sorties, according to the squadron website. They lost 129 aircraft and 618 crewmembers. Another 197 crew were captured, two escaped and 25 evaded capture. Its flyers included Victoria Cross recipient Andrew Mynarski, killed in June 1944 at age 27 while trying to save a trapped crewmate as their bomber went down over France. A 19-year-old Widdicombe chose the air force after signing up for the infantry. Just five-foot-seven, he concluded during his first bayonet drill that he was at a distinct disadvantage. His commanding officer, however, denied his request for a move. That didn’t stop Widdicombe. He sashayed over to the RCAF recruitment office, where he was accepted without hesitation: “If you want to hide from the army, the best place to go is the air force,” the recruiting officer told him. 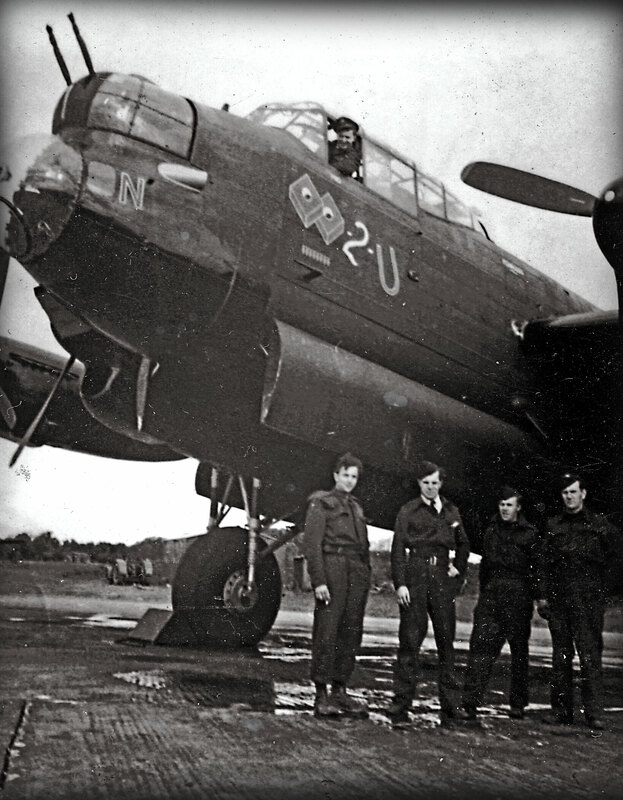 Widdicombe and crew with their Lancaster, Nuts To You. Almost too small for a Lancaster, he wanted to fly the Mosquito, the wooden, twin-engine de Havilland raider that was renowned for its speed and panache. It was not to be. He was relegated to primarily nighttime raids in the biggest bomber of the European campaign, capable of delivering a payload in the order of 14,000 pounds, or more than triple that of the American B-17’s. 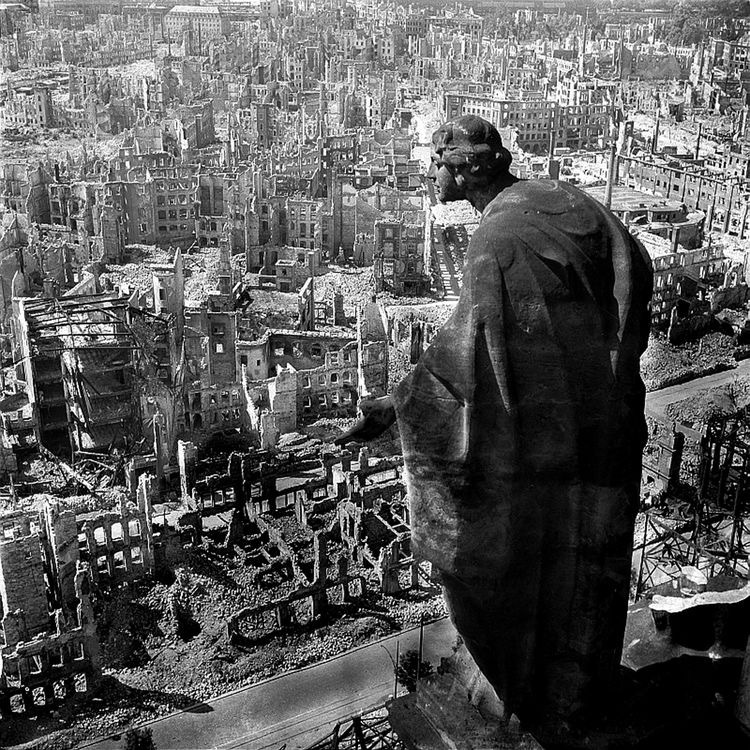 August Schreitmüller’s sandstone sculpture Die Gute (Goodness) on Dresden’s Rathaustrum, or town hall, once overlooked a city known as ‘Florence-on-the-Elbe.’ Photographer Richard Peter, who documented Europe’s ruins after the war, took the picture from the tower looking south. The Lancs had no fighter escorts, except later on during rare daytime raids when they were accompanied by P-51 Mustangs. The Mustangs had drop tanks filled with additional fuel that enabled them to fly all the way to Germany and back. Dresden in February 1945 was Widdicombe’s biggest—nearly 1,000 bombers in a stream hundreds of kilometres long and dozens wide. The B-17s followed the next day. The onslaught continued for two more days and nights, igniting and feeding firestorms that consumed the city and incinerated between 35,000 and 135,000 of its residents, including many refugees escaping the Soviet advance. The figures have been disputed, with some estimates as low as 5,000 dead. Where he was in the bomber stream, Widdicombe has no idea, but “there was nothing but smoke and fire when I was there.” No part of Dresden was spared. Forming up and flying in huge formations at night, in all kinds of weather, could be almost as harrowing as making the target itself, where the searchlights, flak and fighters of all kinds awaited. “If you’re flying in the dark with no lights and you hit a slipstream, it’s kind of unnerving,” he said. “There were two angles to that: if you hit a slipstream, you knew you were pretty well on course because there were other planes there. The bomber crews liked cloud, which Widdicombe called their “comfort blanket.” It was trickier forming up but more difficult for the opposition to find them. And there was plenty of it, flying as they did over the North Sea, especially in winter. Difficult as it was, flying missions was better than the waiting in between, biding time, mourning lost friends, missing home, not knowing where or when the next raid would take place. Once airborne, Widdicombe’s anxieties would slip away. On a good-sized raid, 300 aircraft from multiple bases would link up at a designated rally point, with just 20 minutes passing from the time the first bombs dropped to the last. The more compact a formation, the more efficient the raid. In 23 missions, his aircraft was hit many times by flak—an exploding shell intended to pepper aircraft with crippling shrapnel, like a shotgun shell. “You’d hear it rattling off the fuselage.” Only once, however, did flak inflict serious damage to his plane. By feathering, a pilot turns the blades of a variable-pitch propeller so that their mid-to-outer section is aligned with the airflow and they create minimal resistance, or drag. By 1945, enemy resistance was failing. The Germans were running out of fuel and their fighters couldn’t stay up long. He encountered Me-262s, the first jets in combat. But they never gave him trouble. The pilots, he said, were inexperienced. “They (the jets) were too new for them and their experienced pilots were getting scarce by that time.” Good thing because, with a top speed of almost 900 kilometres an hour, gunners couldn’t rotate their turrets fast enough to track them. Widdicombe was blessed with a good navigator—Hugh Church of Saint John, N.B.—and a solid crew that also included flight engineer Clifford Moore from Hamilton, wireless operator Fred Trigg from Winnipeg and bomb aimer Lew Andrews from Belleville, Ont. They switched out a handful of times to fly with new pilots on their first missions, always coming back to VR-N. All flew home in July 1945, expecting to be redeployed to the Pacific. The plan was abandoned after the Japanese surrendered in August. 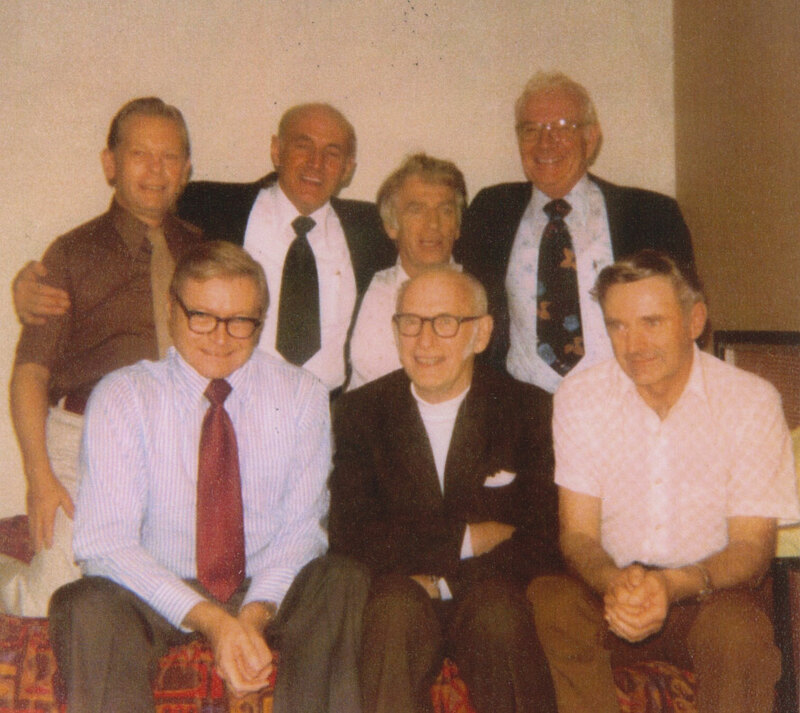 The Lancaster crew in 1977. He has farmed ever since. The last version of his Lancaster VR-N ended up in Dartmouth, N.S., and was eventually sold for scrap. The seven crewmates got together regularly after the war, always keeping in touch. The last of the others died in 2015, leaving only Widdicombe. He didn’t pilot an aircraft after the war until he went up in July with a museum flyer, Peter Moodie, and took the stick of a Tiger Moth for the first time in 77 years. Stirring recollections. Thanks for this and keep up the good work.